James Longstreet was born in Edgefield District, South Carolina, January 8, 1821. 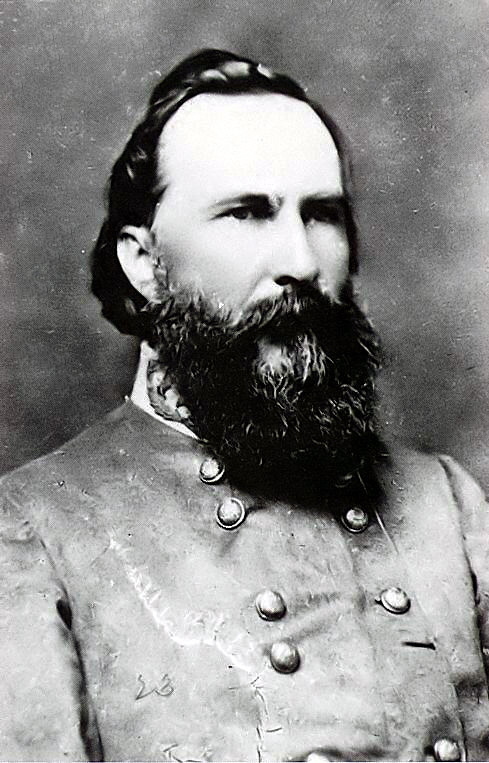 James Longstreet was the fifth child and third son of James and Mary Ann Dent Longstreet. James Longstreet spent eight years of his youth living with his uncle’s family in Augusta, Georgia. James Longstreet attended the United States Military Academy and graduated in 1842, ranking 54th out of 56 cadets in his class. James Longstreet served in the Mexican War and was wounded at Chapultepec. James Longstreet introduced his friend Ulysses S. Grant to his cousin, Julia Dent, and later participated in Grant and Dent’s wedding. James Longstreet married Maria Louisa Garland on March 8, 1848. James Longstreet resigned his commission in the United States Army on June 1, 1861 and joined the Confederate Army. James Longstreet was appointed as a brigadier general, in the Confederate Army on June 17, 1861. James Longstreet was promoted to major general, in the Confederate Army on October 7, 1861. James Longstreet was promoted to lieutenant general, in the Confederate Army on October 9, 1862. James Longstreet fought at the battles of Bull Run, Antietam, Fredericksburg and Chickamauga. As second in command at the Battle of Gettysburg, James Longstreet opposed Robert E. Lee’s decision to attack, instead favoring a strategy of maneuvering the Union Army out of its position. James Longstreet was severely wounded during the Wilderness Campaign. James Longstreet was present when Robert E. Lee surrendered to Ulysses S. Grant at Appomattox Court House on April 9, 1865. The United States Congress restored James Longstreet’s rights of citizenship in June 1868. After the Civil War, James Longstreet joined the Republican Party and resumed a friendship with Ulysses S. Grant. As head of the Louisiana State Militia, James Longstreet was shot and held prisoner by white supremacists in New Orleans during an attempt to overthrow the government of Louisiana in 1874. In 1880, ex-President Grant used his influence to have President Hayes appoint James Longstreet as ambassador to the Ottoman Empire. In 1881, James Longstreet was appointed as U.S. Marshall for Georgia. James Longstreet&#039;s wife of forty-one years, Maria Louisa Garland Longstreet, died on December 29, 1889. James Longstreet published his memoirs, From Manassas to Appomattox, in 1896. At seventy-six years of age, James Longstreet married his second wife, thirty-four-year-old Helen Dortch, on September 8, 1897. James Longstreet died on January 2, 1904, at Gainsville, Georgia. James Longstreet was buried at Alta Vista Cemetery, in Gainsville. James Longstreet’s parents owned a cotton plantation in northeast Georgia. James Longstreet’s father gave him the nickname, “Pete,” when he was a boy. James Longstreet was brevetted as a second lieutenant assigned to the 4th U.S. Infantry on July 1, 1842. James Longstreet was promoted to first lieutenant on February 23, 1847. James Longstreet was promoted to major on July 19, 1858. James Longstreet owned a small number of slaves.